We are delighted that you are considering being married in the Christian Church and specifically at Saint Michael and All Angels Episcopal Church. For over 60 years our sacred spaces have been the setting for many splendid weddings. Should you choose Saint Michael as the location for one of the most joyous and sacred days of your life there are a few items that we would like you to consider. The first consideration for you, as a couple, is to ask yourselves whether or not you want a Christian marriage or simply a place in which to be married. 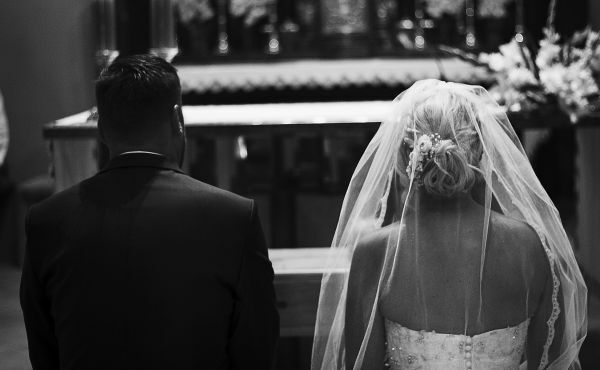 It is vital for couples planning to be married in the church to understand that Christian marriage implies a belief that God, through Jesus Christ, will play an important role in their new relationship and throughout their life together and the wedding service is the beginning of that remarkable journey. By having your wedding at Saint Michael we hope that you will experience the deep and wonderful meaning of Christian marriage which can be lost when the church is reduced to no more than a beautiful setting for a ceremony. One of the two parties is presently a member, or whose parents, or grandparents are members of record of Saint Michael and All Angels Episcopal Church, or as a couple you desire to become members of record at Saint Michael. They are willing to conform to the good standards of our wedding policies and complete the pre marital class series, or its equivalent if currently living outside of the Dallas area. To become members of record at Saint Michael and All Angels the couple will need to attend the next Saint Michael 101 class, make a written monetary pledge to Saint Michael for the current year, and by enrolling his/her/their membership at Saint Michael and All Angels. If there has been a divorce for one or both parties intending to be married, permission of the Bishop of the Diocese of Dallas must be obtained. This upholds the Church’s pastoral responsibility to ensure that divorced persons fully comprehend the reasons for the failure of the first marriage. Therefore, a minimum of 3 months is needed between initiating the wedding paperwork and the date of the proposed wedding. 1. Attendance at four Sunday morning pre-marital classes. b. One session 1-hour session which will include going over the findings of the FOCUSS Inventory. There will be a fee of $350 for the private counseling. To register for classes please send an email to [email protected] with the dates you will be attending along with names, home addresses, contact numbers, email addresses and wedding date.